On 14 December the Chamber of Deputies approved the initiative to legalize Special Economic Zones (SEZ) which had been presented to the federal Congress in September of this year. These SEZs will be regions in which investors face financial benefits, particularly in terms of “flexible labor.” In this sense, the SEZs serve foreign economic interests and would institute a special customs regime, all of this toward the end, as the government claims, of promoting development in southern Mexico by means of attracting foreign investment. In accordance with information from the president’s office, there are plans to build infrastructure projects using an initial investment of nearly 115 billion pesos, including new gaseoducts, railroads, highways, ports, and airports. According to Chiapas Paralelo, this investment would come from public coffers but is “designed for by by private capital, in a mercantile logic […] whereby the people of Chiapas is present only as labor, leaving to the side the question of who owns the natural resources.” In this way, the projects are expected to create 115,000 jobs over the next 10 years, though analysts indicate that it will attract specialists from elsewhere in the country, leaving the most precarious jobs for locals. 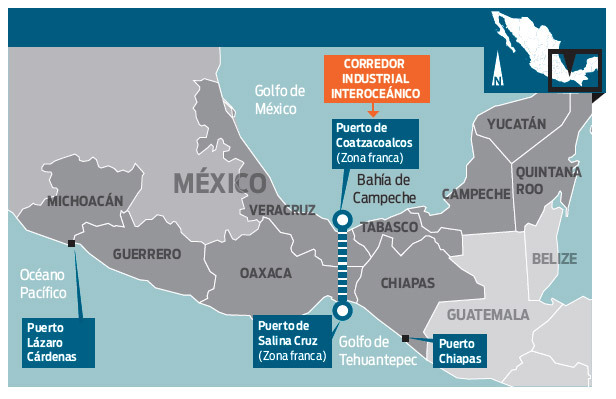 The planned SEZs include the “Lázaro Cárdenas” port, incorporating municipalities straddling Michoacán and Guerrero toward the end of exploitation; the “Interoceanic Corridor of Tehuantepec,” which will affect Coatzacoalcos, Veracruz, Salina Cruz, and Oaxaca, and will permit commercial transit between the Pacific Ocean and the Gulf of Mexico; and lastly, the “Chiapas Port” which would facilitate exports to Asia. The permits to construct and administer a zone can be granted for up to 40 years. 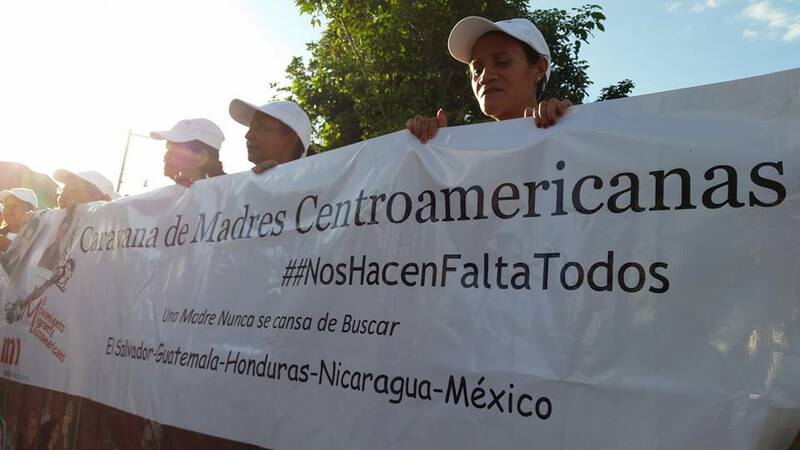 On 30 November 39 mothers of disappeared Central Americans migrants began their XI caravan through Mexico. Using slogans like “We are missing everyone” and “A mother never tires of looking,” these women from Guatemala, Honduras, El Salvador, and Nicaragua left from the “72” migrant home in Tenosique, Tabasco, for Villahermosa. Subsequently they were received in Palenque, from where they continued to Veracruz and Puebla before arriving to Mexico City. From there they continued on to Oaxaca, concluding their caravan on Saturday 18 December in Hidalgo, Chiapas. Dressed with shirts that identify the caravan and showing photos of their lost relatives, they demanded “Not another disappearance!” and held expositions in public plazas, visiting different migrant homes, prisons, and hospitals, among other sites. Accompanied by human-rights defenders and civil national and international organizations, they followed migratory routes, performed ceremonies on railways, and consulted officials from the three levels of government to request their assistance in the search. All of this they expressed with the hope of finding their sons. 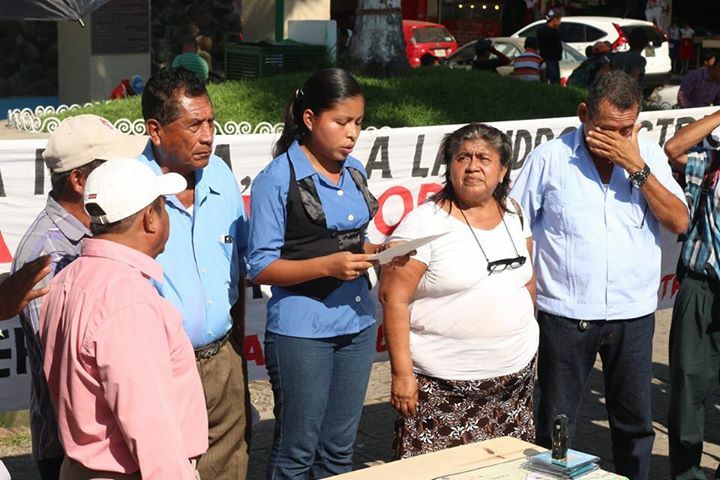 According to the coordinator of the Mesoamerican Migrant Movement and of the caravan itself, Martha Sánchez Soler, this caravan is “something special” because it is the first time that they have submitted denunciations before the Federal Attorney General’s Office (PGR) against the Mexican State for forcible disappearance. For her, the phenomenon is that “migrants arrive in Mexico, disappear, and the authorities make no investigations. 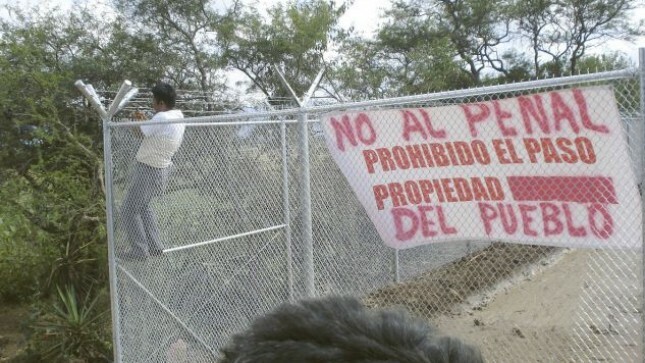 It’s a perfect crime.” Another participant in the caravan demanded that the Mexican government not discriminate or stigmatize migrants, for this is a demand that they have made “each year we have visited Mexico. We seek our sons and we are gladdened whenever one of us does find her loved one.” During the last 10 years of caravans, there have been more than 200 reunions between mothers and sons. In the caravan of this year a mother has found her sound in Tabasco. It is because of such experiences that the women continue to search with hope. It bears mentioning that Mexico is considered one of the countries in which the question of migration is especially complicated. It has high internal migration and besides that, it is crossed by migrants emanating from Central America en route to the U.S. Although there are no official statistics, the United Nations International Organization for Migration said that “every year some 150,000 people cross the southern border of Mexico illegally.” A 2011 report from the National Commission on Human Rights (CNDH) indicates that there at least 20,000 kidnappings of Central American migrants in Mexico every half-year. 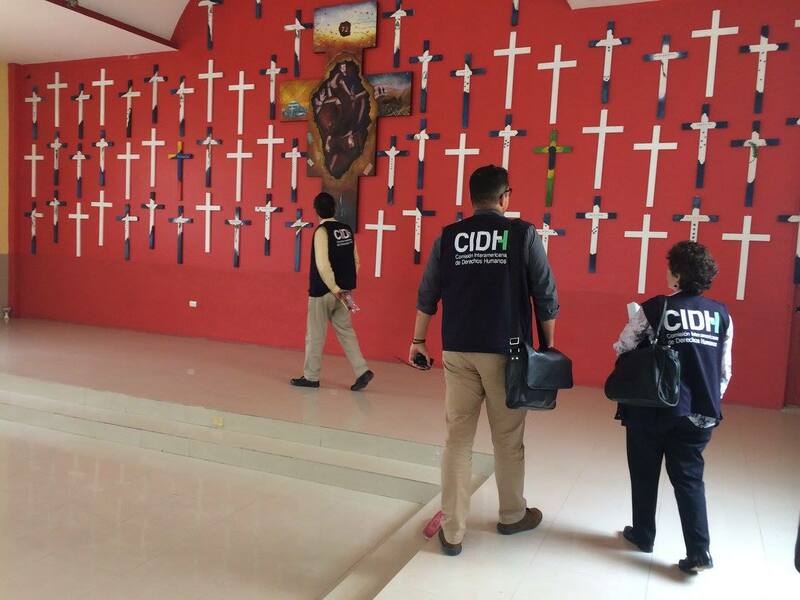 From 28 September to 2 October, the Inter-American Commission for Human Rights (IAHCR) held a visit to Mexico to observe the human-rights situation in the country, with an emphasis on extrajudicial executions, torture, and forcible disappearances. Bertha Santoscoy, a representative from the Organization of American States (OAS), indicated that one of the criteria most utilized by the IACHR to carry out the investigation is “the gravity and elevated number of denunciations regarding systematic violations of human rights that are detected in any given country.” The delegation sought to monitor the human-rights situation, collect information, and evaluate the observation of international law. “Our concern has been constant in recent years, but it is true that at this time there have been a series of very grave incidents,” remarked Cavallaro, member of the IACHR. Beginning on 28 September, the delegation visited Guerrero, Tabasco, Nuevo León, Coahuila, Veracruz, and Mexico City. The delegation led by the president of the IACHR, Rose-Marie Belle Antoine, interviewed governmental authorities from the three levels of government and met with civil-society representative as well. As part of the visit, on 29 September, the delegation also met with several organizations working with migrants and refugees in Tenosique, Tabasco. In this way, it collected testimonies of victims regarding human-rights violations and from relatives of victims in the different places it visited. 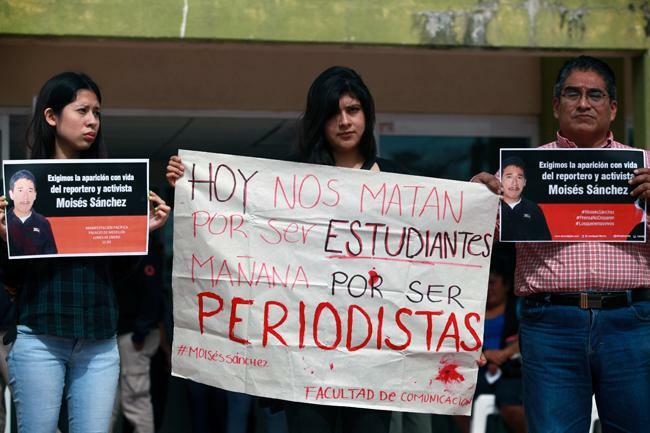 Beyond this, the IACHR carried out a meeting with the Interdisciplinary Group of Independent Experts (GIEI) to address the latter’s report on the events of Ayotzinapa. On 2 October, the delegation will give a press-conference to share its preliminary observations. For 2016 it plans to publish a report regarding its findings. The Social Observatory on Human Rights and Migration at the southern border of Mexico has presented a new means of contributing to the analysis of social organizations and the citizenry in general regarding the situation of permanent conflict that is lived in the zone of the southern border of Mexico: that is, in Chiapas, Tabasco, Veracruz, and the Isthmus of Tehuantepec. This barometer is a monthly tool of information and analysis regarding human-rights violations committed against people and social organizations in the region of the southern border. The barometer examines public denunciations and communiques that have been organized by the Observatory on the southern border. The objective is to contribute to the construction of an early warning system on human-rights violations and to strengthen the protective mechanisms for human-rights defenders in the area.